Whispers in the Loggia: To Europe's Lawmakers, A Call For "Transcendent Human Dignity"
To Europe's Lawmakers, A Call For "Transcendent Human Dignity"
As the European Union has expanded, the world itself has become more complex and ever changing; increasingly interconnected and global, it has, as a consequence, become less and less "Eurocentric". Despite a larger and stronger Union, Europe seems to give the impression of being somewhat elderly and haggard, feeling less and less a protagonist in a world which frequently regards it with aloofness, mistrust and even, at times, suspicion. I feel bound to stress the close bond between these two words: "dignity" and "transcendent". "Dignity" was a pivotal concept in the process of rebuilding which followed the Second World War. Our recent past has been marked by the concern to protect human dignity, in contrast to the manifold instances of violence and discrimination which, even in Europe, took place in the course of the centuries. Recognition of the importance of human rights came about as the result of a lengthy process, entailing much suffering and sacrifice, which helped shape an awareness of the unique worth of each individual human person. This awareness was grounded not only in historical events, but above all in European thought, characterized as it is by an enriching encounter whose "distant springs are many, coming from Greece and Rome, from Celtic, Germanic and Slavic sources, and from Christianity which profoundly shaped them" (2), thus forging the very concept of the "person". At the same time, however, care must be taken not to fall into certain errors which can arise from a misunderstanding of the concept of human rights and from its misuse. Today there is a tendency to claim ever broader individual rights – I am tempted to say individualistic; underlying this is a conception of the human person as detached from all social and anthropological contexts, as if the person were a "monad" (μονάς), increasingly unconcerned with other surrounding "monads". The equally essential and complementary concept of duty no longer seems to be linked to such a concept of rights. As a result, the rights of the individual are upheld, without regard for the fact that each human being is part of a social context wherein his or her rights and duties are bound up with those of others and with the common good of society itself. I believe, therefore, that it is vital to develop a culture of human rights which wisely links the individual, or better, the personal aspect, to that of the common good, of the "all of us" made up of individuals, families and intermediate groups who together constitute society (3). In fact, unless the rights of each individual are harmoniously ordered to the greater good, those rights will end up being considered limitless and consequently will become a source of conflicts and violence. To speak of transcendent human dignity thus means appealing to human nature, to our innate capacity to distinguish good from evil, to that "compass" deep within our hearts, which God has impressed upon all creation (4). Above all, it means regarding human beings not as absolutes, but as beings in relation. In my view, one of the most common diseases in Europe today is the loneliness typical of those who have no connection with others. This is especially true of the elderly, who are often abandoned to their fate, and also in the young who lack clear points of reference and opportunities for the future. It is also seen in the many poor who dwell in our cities and in the disorientation of immigrants who came here seeking a better future. This loneliness has become more acute as a result of the economic crisis, whose effects continue to have tragic consequences for the life of society. In recent years, as the European Union has expanded, there has been growing mistrust on the part of citizens towards institutions considered to be aloof, engaged in laying down rules perceived as insensitive to individual peoples, if not downright harmful. In many quarters we encounter a general impression of weariness and aging, of a Europe which is now a "grandmother", no longer fertile and vibrant. As a result, the great ideas which once inspired Europe seem to have lost their attraction, only to be replaced by the bureaucratic technicalities of its institutions. Together with this, we encounter certain rather selfish lifestyles, marked by an opulence which is no longer sustainable and frequently indifferent to the world around us, and especially to the poorest of the poor. To our dismay we see technical and economic questions dominating political debate, to the detriment of genuine concern for human beings (5). Men and women risk being reduced to mere cogs in a machine that treats them as items of consumption to be exploited, with the result that – as is so tragically apparent – whenever a human life no longer proves useful for that machine, it is discarded with few qualms, as in the case of the ill, the terminally ill, the elderly who are abandoned and uncared for, and children who are killed in the womb. This is the great mistake made "when technology is allowed to take over" (6); the result is a confusion between ends and means" (7). It is the inevitable consequence of a "throwaway culture" and an uncontrolled consumerism. Upholding the dignity of the person means instead acknowledging the value of human life, which is freely given us and hence cannot be an object of trade or commerce. As members of this Parliament, you are called to a great mission which may at times seem futile: to tend to the needs, the needs of individuals and peoples. To tend to those in need takes strength and tenderness, effort and generosity in the midst of a functionalistic and privatized mindset which inexorably leads to a "throwaway culture". To care for individuals and peoples in need means protecting memory and hope; it means taking responsibility for the present with its situations of utter marginalization and anguish, and being capable of bestowing dignity upon it (8). To answer this question, allow me to use an image. One of the most celebrated frescoes of Raphael is found in the Vatican and depicts the so-called "School of Athens". Plato and Aristotle are in the centre. Plato’s finger is pointed upward, to the world of ideas, to the sky, to heaven as we might say. Aristotle holds his hand out before him, towards the viewer, towards the world, concrete reality. This strikes me as a very apt image of Europe and her history, made up of the constant interplay between heaven and earth, where the sky suggests that openness to the transcendent – to God – which has always distinguished the peoples of Europe, while the earth represents Europe’s practical and concrete ability to confront situations and problems. The future of Europe depends on the recovery of the vital connection between these two elements. A Europe which is no longer open to the transcendent dimension of life is a Europe which risks slowly losing its own soul and that "humanistic spirit" which it still loves and defends. 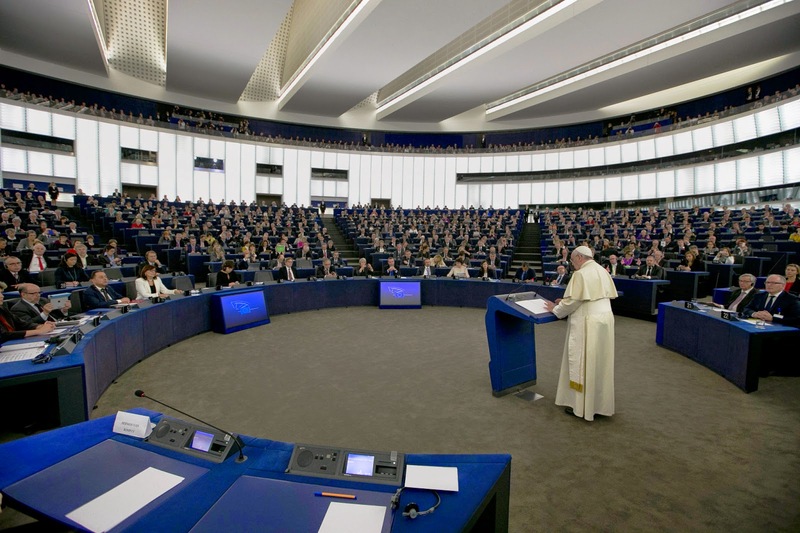 I wish, then, to reiterate the readiness of the Holy See and the Catholic Church, through the Commission of the Bishops’ Conferences of Europe (COMECE), to engage in meaningful, open and transparent dialogue with the institutions of the European Union. 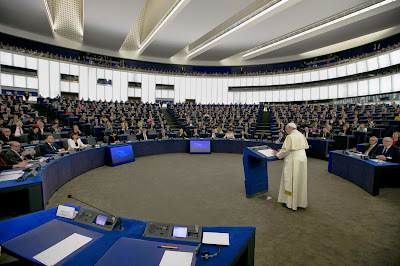 I am likewise convinced that a Europe which is capable of appreciating its religious roots and of grasping their fruitfulness and potential, will be all the more immune to the many forms of extremism spreading in the world today, not least as a result of the great vacuum of ideals which we are currently witnessing in the West, since "it is precisely man’s forgetfulness of God, and his failure to give him glory, which gives rise to violence" (9). Ladies and Gentlemen, Members of the European Parliament, within this dynamic of unity and particularity, yours is the responsibility of keeping democracy alive, democracy for the peoples of Europe. It is no secret that a conception of unity seen as uniformity strikes at the vitality of the democratic system, weakening the rich, fruitful and constructive interplay of organizations and political parties. This leads to the risk of living in a world of ideas, of mere words, of images, of sophistry… and to end up confusing the reality of democracy with a new political nominalism. Keeping democracy alive in Europe requires avoiding the many globalizing tendencies to dilute reality: namely, angelic forms of purity, dictatorships of relativism, brands of ahistorical fundamentalism, ethical systems lacking kindness, and intellectual discourse bereft of wisdom (10). Europe has always been in the vanguard of efforts to promote ecology. Our earth needs constant concern and attention. Each of us has a personal responsibility to care for creation, this precious gift which God has entrusted to us. This means, on the one hand, that nature is at our disposal, to enjoy and use properly. Yet it also means that we are not its masters. Stewards, but not masters. We need to love and respect nature, but "instead we are often guided by the pride of dominating, possessing, manipulating, exploiting; we do not ‘preserve’ the earth, we do not respect it, we do not consider it as a freely-given gift to look after" (11). Respect for the environment, however, means more than not destroying it; it also means using it for good purposes. I am thinking above all of the agricultural sector, which provides sustenance and nourishment to our human family. It is intolerable that millions of people around the world are dying of hunger while tons of food are discarded each day from our tables. Respect for nature also calls for recognizing that man himself is a fundamental part of it. Along with an environmental ecology, there is also need of that human ecology which consists in respect for the person, which I have wanted to emphasize in addressing you today. Upon you, as legislators, it is incumbent to protect and nurture Europe’s identity, so that its citizens can experience renewed confidence in the institutions of the Union and in its underlying project of peace and friendship. Knowing that "the more the power of men and women increases, the greater is the individual and collective responsibility" (12), I encourage you to work to make Europe rediscover the best of itself. An anonymous second-century author wrote that "Christians are to the world what the soul is to the body" (13). The function of the soul is to support the body, to be its conscience and its historical memory. A two-thousand-year-old history links Europe and Christianity. It is a history not free of conflicts and errors, and of sins, but one constantly driven by the desire to work for the good of all. We see this in the beauty of our cities, and even more in the beauty of the many works of charity and constructive human cooperation throughout this continent. This history, in large part, must still be written. It is our present and our future. It is our identity. Europe urgently needs to recover its true features in order to grow, as its founders intended, in peace and harmony, since it is not yet free of conflicts. 1 JOHN PAUL II, Address to the European Parliament (11 October 1988), 5. 2 JOHN PAUL II, Address to the Parliamentary Assembly of the Council of Europe (8 October 1988), 3. 3 BENEDICT XVI, Caritas in Veritate, 7; Cf. SECOND VATICAN ECUMENICAL COUNCIL, Pastoral Constitution on the Church in the Modern World Gaudium et Spes, 26. 4 Cf. Compendium of the Social Doctrine of the Church, 37. 6 BENEDICT XVI, Caritas in Veritate, 71. 9 BENEDICT XVI, Address to the Members of the Diplomatic Corps, 7 January 2013. 11 FRANCIS, General Audience, 5 June 2013. 12 Cf. SECOND VATICAN COUNCIL, Gaudium et Spes, 34. 13 Cf. Letter to Diognetus, 6.